You've probably seen the commercials for XM Satellite Radio with the guy driving his car into work, literally, while listening to The Black Eyed Peas. Effective advertising, but that's not what got me interested. After hearing from others about the stations and offerings on XM Radio, I decided to give it a try. There are a couple of companies offering satellite radio now, and even some of the satellite TV broadcasters offer music stations as well as TV. 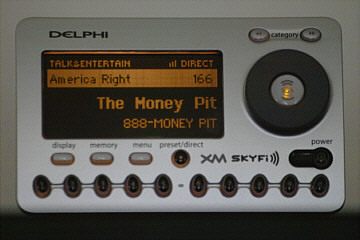 I decided to go for Delphi's XM satellite radio because of the selection of stations. The total cost for my setup was about $190, which included the base unit and antenna for home stereos (there is also a portable one for car and boom-box use), the home hook-up kit, and a 50 foot extension for the antenna wire. Some will say that is too much for a radio add-on to a stereo, but after listening for awhile, I'd have to disagree. The Setup: The setup was very straight forward, except for one thing in my case. My house faces South, but the stereo is on the North side of the living room. That puts about 30 feet of house between the base unit, and where I would have to put the antenna. So for me it was a matter of getting the antenna extension cable (about $40), and drilling some holes in my floor and front wall. I had to snake the wire through the holes, through the basement, and out the front wall, so that I could mount the small antenna on the front of the house. With a little adjusting (which really requires two people) I had it so that it would give me the maximum signal. Then it was just a matter of hooking to the stereo system, which was a snap. Upon starting the system up, you can only hear one station, the "preview" station. You then have to call, or log onto their web site, and give them your credit card information. About an hour after I signed up on their web site, I was able to access all 120+ stations. Problem: On first listen, the sound quality was terrible, and only coming out of the left channel. I had read one review already that said that the RCA cable that comes with the Delphi unit is defective. Sure enough, I simply substituted any old RCA to mini-jack cable I had lying around, and the problem went away. This is the only thing I can say was really bad about the Delphi unit. The cable it came with was absolutely useless, and there is no excuse for that. The Unit: The base unit from Delphi is small, but practical. It has a front screen that shows you what station you are on, the artist playing, and the name of the song. Very nice indeed. You can select stations by turning the dial, and pressing the button in the dial's center, or you can use the keys to plug in the station you want. There is also a small remote control unit that can be used to change channels from across the room. There is also a "category" selector, from which you can select just the jazz, or just the "urban" music station lists. You can also set "presets" that you can call up quickly. Stations: I purchased XM Radio for a few major reasons. First, I'm an old jazz fan, but I can't stand "smooth jazz". I like fusion, funk, and techno jazz, but I'm not real big on Dixieland, or traditional jazz. So for me, "Beyond Jazz" was the best mix of stuff that I enjoy. And it was jazz that I couldn't possibly get anywhere else, such as Steps Ahead, Wayne Shorter, Billy Cobham, etc. There are so many stations, I really can't go over all the selections. Down low on the dial, they have music by decades: so at channel 4 you get 40's music, at channel 5 you get 50's music, right up through channel 9 and 90's music. Also, just in time for the election season, you can get plenty of talk radio on XM. I was very interested in getting the new "liberal" Air America talk radio ("America Left"). In fact, I probably listen to Air America even more than I listen to Beyond Jazz. My favorite show is the Al Franken show, on between 12 noon and 3pm EST Monday through Friday. If you are a liberal, and you can't stand conservative TV or radio talk anymore, Air America Radio is for you. 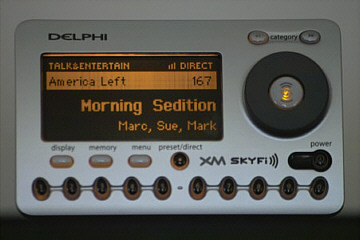 Of course, if you're a conservative, and Limbaugh, O'Reilly, Hannity, Ingram, Novak, Carlson, and the huge host of other conservative propagandists aren't enough for you, you can select "America Right", which is only one station away on the XM dial. Live Concerts: Perhaps the very best thing about XM Radio is the "XM Live" concert channel. In one day alone, I listened to a live Herbie Hancock concert, and a Live Chick Corea concert. They were great. The station broadcasts live concerts from all around the world, so this one channel alone is almost worth the subscription price. Requests: Many of the stations on XM Radio have their own web sites, and you can log on to look at the lineup, or even make a request. At "Beyond Jazz", I requested a John McLaughlin song from the 1980's (Nightriders), and shortly thereafter received an email back that they would play an entire hour of classic John McLaughlin that Sunday Night at 7pm my time. That is truly awesome. 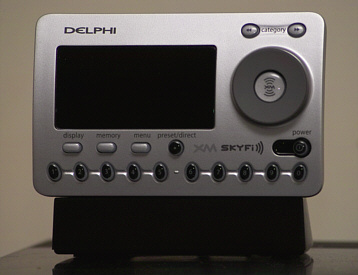 Conclusions: Delphi's XM satellite radio rocks! It also jazzes, and hip hops and has tons of talk. It also has plenty of local info, like 24/7 weather and traffic for about 25 major metropolitan areas. I love it, and I don't think I could go without it now that I've had a taste. If you like music and talk, and you're sick of the commercial crap out there, XM Radio is for you! Price: Approximately $150US retail, plus $9.99 a month subscription ($40 more if you need the antenna extension wire). Rating, : 4.6 out of 5 smiley faces (92%). Recommended over all other radio, but get yourself a good RCA to mini-jack converter cable before you even start the setup.